I have come to realise that my ambition of being a writer involves a lot of waiting. The frantic activity of typing like mad to get the submission in on time is offset by the weeks, if not months, of waiting to hear the results. Fortunately I’m a patient woman and don’t mind waiting for things. What I struggle with however are the overwhelming nerves that all this waiting creates. My solution is to distract myself with more writing, which means more busy activity of typing, more submissions and yep, you guessed it, more waiting. Most families inherit things from their ancestors. An antique vase that no one can stand but can't bring themselves to get rid of because it has history. The colour of their eyes that comes from their father, or their mothers nose. Me, well I inherited the family quest in addition to my brown eyes from my dad. The quest has been passed down from my grandmother to my mother, aunts and even cousins. We all activity pursue the same goal, and so far we have all failed. So what is this impossible mission? It's the quest for the perfect handbag. I came close to achieving it once. I found a bag with just the right number of separate pockets. 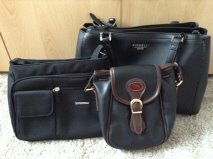 There was a place for my keys, a pouch for my phone, somewhere for my make-up and purse and even a handy little pocket for my business cards so I could avoid the embarrassing unprofessional rummage. Finally there was a larger section for everything else. There was just one problem, it turns out that there's a lot of 'everything else'. The solution was to buy a bigger bag. The problem with this one though is that it lacks sufficient small pockets so everything is lumped together in the 'everything else' section. No matter how carefully and neatly I pack it, every time I unzip it the contents have all helpfully rearranged themselves in a random assortment of chaos. Rummaging ensues. The men in our family think we're crazy. According to them everything essential can be fitted into pockets. No bag is required. I shall refrain from getting on my soap box about the lack of pockets in women's clothing. The thing is that their theory that anything that doesn't fit can be left behind isn't always true. At such times however they do have a solution. They give this large non fitting item to me to carry in my bag and add to the random assortment and create the need for more rummaging as I wade through their stuff as well as my own. They however are still travelling light with just the contents of their pockets. Do they ever offer to carry my bag with its additional weight? Nope. I'm thrilled to be able to share the cover for Kathryn Freeman's 'Before You'. When life in the fast lane threatens to implode … Melanie Taylor’s job working for the Delta racing team means she is constantly rubbing shoulders with Formula One superstars in glamorous locations like Monte Carlo. But she has already learned that keeping a professional distance is crucial if she doesn’t want to get hurt. New Delta team driver Aiden Foster lives his life like he drives his cars – fast and hard. But, no matter how successful he is, it seems he always falls short of his championship-winning father’s legacy. If he could just stay focused, he could finally make that win. The latest issue of Scribble is out and my article 'Embracing Fear' is in there. 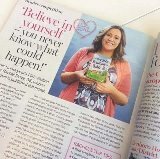 It's a lovely surprise when I open up a magazine and discover my name printed on the crisp white paper. There's something so unexpected and thrilling about seeing it there, even though I knew it was going to be published. The first thing I did was to read the whole article. I always do. The words are never a surprise to me, after all it's not as though I've never seen them before. Yet the fact that it has been published is momentous, and such an event can not be allowed to pass by with a flick of the page. Though admittedly I read with baited breath, silently praying that no typos had slipped through the countless pre-submission reads and rereads. The article, as you can probably guess from its title, aims to encourage other writers to overcome the fears that kept me from following my creative dreams for years. I find it astounding that the thing I most love to do is still the thing that terrifies me the most. Writing is personal and subjective, and to attempt to get published is to put everything you are on to a page for everyone to see and judge. It's a daunting prospect. The alternative however is to simply keep my writing to myself, or even to cease writing entirely. The latter is impossible, as any writer will tell you. The ideas don't stop just because you don't write them down. They just get more and more impatient and persistent at being ignored. They bounce around in your head at night preventing you from sleeping, or distract you from the task you are supposed to be concentrating on, until eventually you succumb and pick up the pen again. As for keeping my writing to myself, well I've been there and done that. It's unfulfilling and lonely. If you've been following my Mslexia blog series, you'll know that I also write song lyrics. I have notebooks filled with lyrics that are confined to their pages in a flat kind of existence without the companionship of music to fill them with life. Story's are no different. They too need to be read to make them whole. Their purpose is to share experiences and secrets, to bring joy or convey sadness. If no-one ever reads them they will be as unfulfilled as their writer. The one who is clinging to a dream that they lack the confidence to ever try to attain. I might not have all the answers on how to achieve success, but the biggest piece of advice I can offer is to take a chance. Of course there are no guarantees. There's a chance you could fail. But there's also a chance that you might just succeed. Isn't that worth the risk? *I'm assured by my fellow writers that this is a common affliction and simply should be viewed as evidence that I am indeed a writer, as opposed to certifiably insane. Though given that they suffer from the same affliction, their advice may be a teeny tiny bit biased. When I taught full time, I used to write on weekends mostly, having marking and lesson preparation to do in the week, as well as the usual child rearing and running of a house. After writing The Chic Boutique on Baker Street, I decided to take the plunge and take a year off to write full time. Lots of time to write, I thought, the boys being at school 6 hours a day, plenty of time to do everything! How wrong I was! Looking back, I don't know how I ever fitted in a job as well as studying and everything else. I am getting to grips with everything now, so I thought I would share some tips I have picked up. NaNoWriMo: write a novel in a month. I fail this every year, but I did have a great start to my current WIP by taking part. 50,000 words in a month. Great support and encouragement, and well worth a go. Delegate: do you really need to do everything yourself? Could your other half do the bath time, or the tea once a week? An hour's worth of writing right there, run, hide, get the words onto the page. Make use of technology and the modern age: shopping? Get it delivered. Bills? Pay them online. Carve out that time to yourself. Run errands in one swoop, and plan ahead. Ignore the house. Sometimes, the housework has to be ignored. Working from home is great, but as in my case, it means sharing my workspace with two kids, a man, a cat and a dog. Who all make mess and need things. Deal with what you need to, then write. Use the peace and quiet. Ignore the dishwasher. Set the washer going, then write till it's finished. Read. Don't forget to read. Remember why you write, for the joy on the page. Read something different to your genre, read research novels, a magazine, anything. Just don't stop reading. 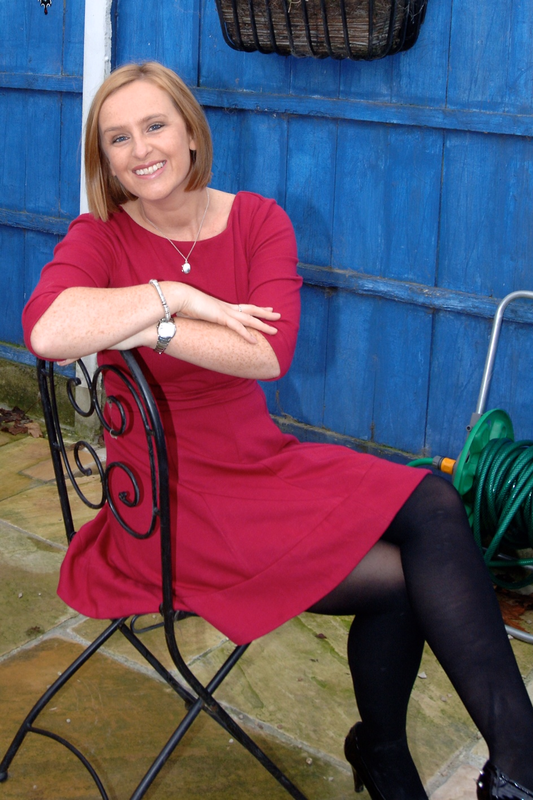 Rachel Dove is the winner of the 2015 Flirty Fiction Competition run by Prima magazine and Mills & Boon, winning against other 300 other entrants to be the next Mills & Boon author. 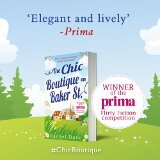 Her debut book, The Chic Boutique on Baker Street, is out now. Recently single and tired of the London rat race Amanda is determined to make her dreams of setting up an idyllic countryside boutique come true, and the picturesque village of Westfield is the perfect place tomake a fresh start.